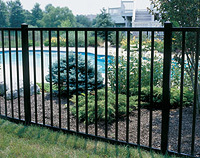 Delgard’s Aero fence provides the comfortable look of Residential fence with added strength and durability. Aero’s unique versatility makes this fence a great choice for swimming pool fence, estate fencing, golf courses, and housing developments. Matching fence gates are available in widths of 36”, 48", 60", 72", 84", 96" and double or driveway gates sizes of 72”, 96", 120", 144", 168", 192" and feature self-closing hinges and our new Versa-Latch or Magna Latch. Our Aero fences feature 1” x 5/8” rounded corner pickets, 1 1/2” x 1 1/8” rounded corner rails, and 2 1/2” square posts. All fences come pre-assembled. All styles are 100 -13/16" wide except Sentry, which has 71" post centers.